Don’t overlook poetry writing in your homeschooling high schooler’s curriculum. Poetry teaches concise and creative use of words and thoughts- an absolutely necessary life skill! Christian homeschoolers who learn to use words well can feel confident as God calls them to any area of work or service. For the inexperienced or under-experienced poetry writer, Introductory Guide to High School Poetry Writing is an enjoyable way to introduce your homeschooler to the power and fun of words. 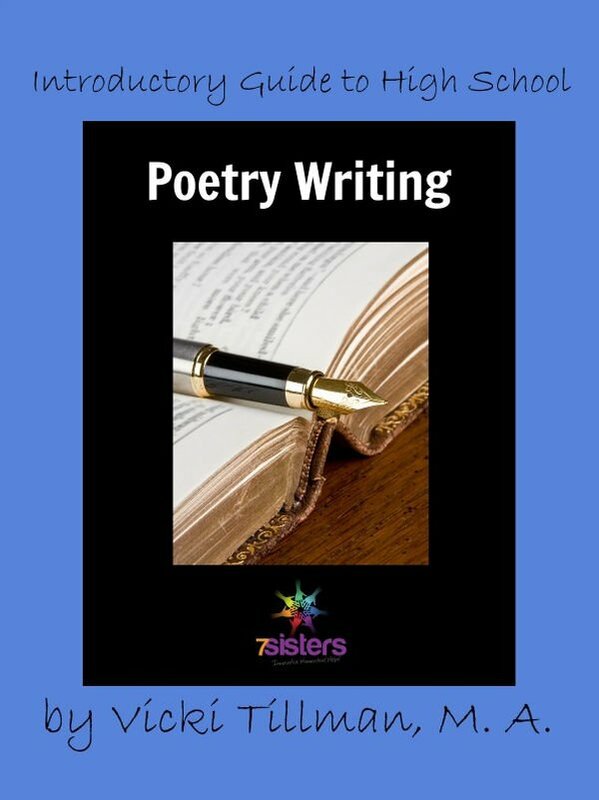 Creativity is waiting to be uncovered with 7Sisters poetry writing curriculum! Introductory Guide to High School Poetry Writing, by Vicki Tillman is a 25-page downloadable pdf workbook geared to middle or high school students who have very little experience with writing poetry. It is designed to be used over a 5-week span. Poetry is intimidating to many students and to some homeschooling parents as well, but poetic language and expression become accessible and fun with Vicki’s poetry writing curriculum guides. Explore poetry and give your homeschooling teen an opportunity for fun and growth in word power! Click here to view an excerpt from Introductory Guide to High School Poetry Writing. What are homeschool parents saying about 7Sisters Poetry Writing Curriculum? “I’m a teacher of a high school literature co-op. We decided to tackle poetry for the second quarter. We used your beginning poetry writing guide. I had students who were very reluctant to write poems, to the point of not wanting to take the class. After six weeks of using your guide my students were requesting the next installment and had begun compiling their poems into volumes. It was so teacher friendly. We are excited about using the intermediate guide in the winter!” – Kristen M.
“I had been able to do a poetry appreciation, but had no idea how to teach the components, and hadn’t found anything easy to assist me. I don’t schedule this as such, but my daughter usually fits this in a day or two a week because she is interested and has found it enjoyable. Thank you.” – Les M.
Poetry Writing in Homeschool – Here’s How!